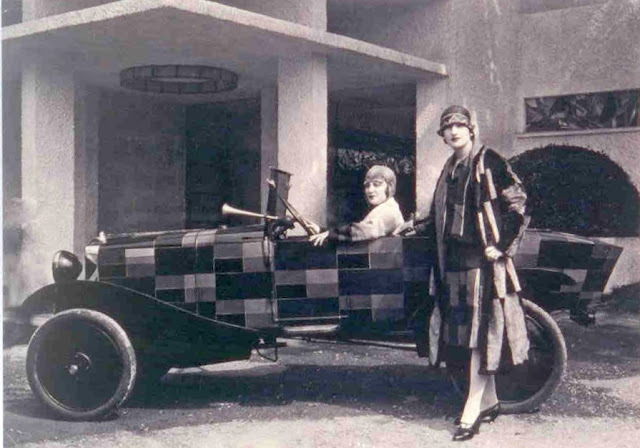 Of course, in my dreams, I would own a Sonia Delaunay dress or coat or car! Alas, the pecuniary reality is that such things will never be in my grasp. 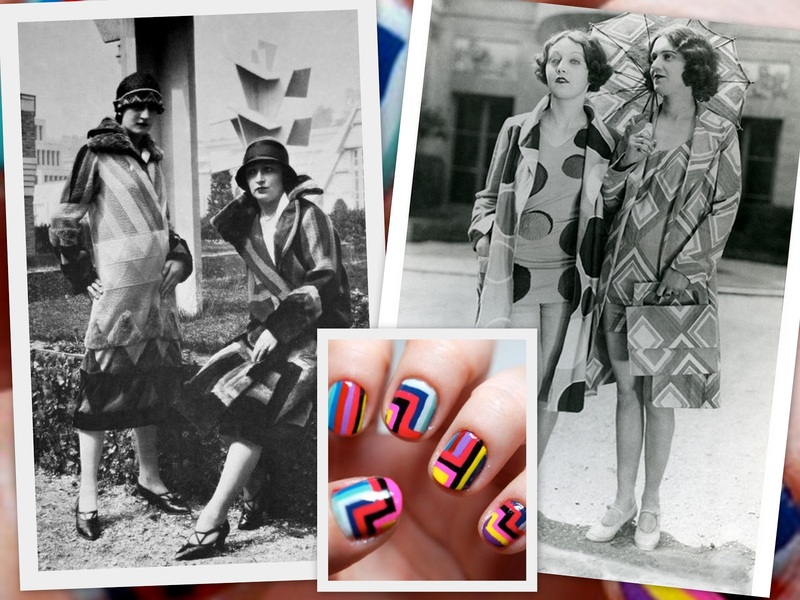 HOWEVER, I recently spied a very Delaunay-inspired manicure that I'm aching to try! How fabulous are these cubist fashions. It seems like her work is probably very hard to come by. Very artistic. Do you have the book Cubism and Fashion? Very inspirational. I would have loved to have seen this exhibit. So very gorgeous! I just adore the serene blue palette in the first image. Those nails are marvelous and actually look like they'd be fairly easy for the average (non-nail art magician) gal to recreate (unlike a lot of fancy nail art out there). Have a wonderful weekend, dear gal! I have to admit (I am going to be unpopular here) that I am not really a fan of the cubist style. Delaunay is known for pioneering Orphism, which is a less severe form of Cubism, imho. 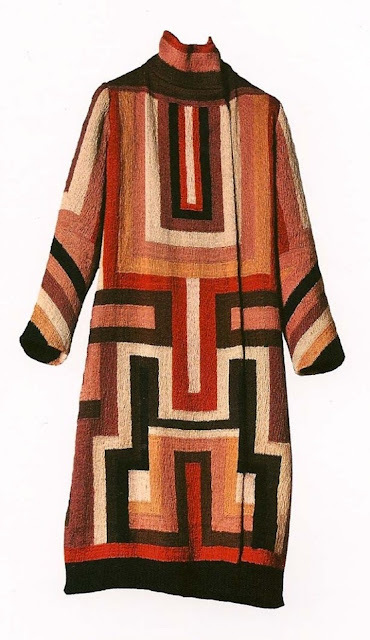 Anyway, I love that we all have our own personal reactions to the bold patterns and colours of this designer!! I LOVE these! I went through a serious phase of obsession with geometric/30s-40s atomic prints a few years ago. I especially love the nails. 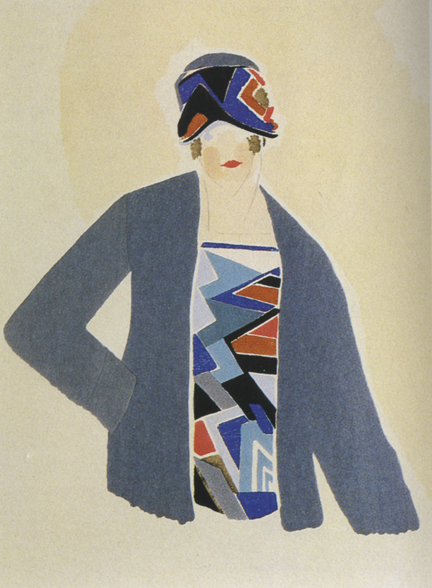 I've always loved the art of Sonia Delaunay´but never knew that she designed clothes as well. These clothes are stunning! I'm obsessed with them from the very first sight. Thank you for sharing. Have a wonderful week!